10 Ways to get WILD on Spring Break! 1. Scale a mountain range in a windstormIt was like hiking across a cloud. To our right, the vast Pacific, to our left an ominous outline of the mainland, barely visible across the white-capped waves. The ascent to Montañon Ridge left us breathless and humbled, and it wasn't until we reached the top of the peak that we were able to clear our minds. After a 14 mile hike through valleys of wildflowers and sagebrush, we stood atop the world with 20 knot winds billowing in our faces. Is this what it's like to feel alive? 2. Tan your upper thighsThough I can't condone too much tanning, it never hurts to introduce a few new hues to the pasty upper thigh region, and what better place to let them hang out than on top of the world! The crew established a well-deserved resting spot after hiking across Santa Cruz Is. for hours, lounging in the tall grass, enjoying views of the surrounding ocean and snacking on some choice berries and nuts. And the occasional island fox. 3. Reenact the scene from Lord of the RingsDon't lie, pretending to be Legolas, Aragorn or any of the rest of the fellowship, coasting down the river in canoes and staring up at gargantuan rock pillars has always been on the "to-do" list. This ITW crew decided to make it a reality, paddling down Utah's Green River, only to find out that whoever named the river was colorblind. They destroyed the one ring nonetheless. For the most part, the Green River Crew remained (relatively) shipshape. Finding camp was a breeze and the cooking brought the group together. It wasn't until they realized that they had to remove all their excrement in a metal box that things began to fall apart. Void of any remaining dignity, the squad gave up hope of staying clean and let out their inner grime. Into The Wild fosters community, founded on the belief that we can bond through a familiar appreciation of the outdoors. So, while scenic vistas are definitely "in" right now, kicking back at Sykes Hot Springs with a few like minded adventurers can be just the right thing to initiate friendships. In the Ventana Wilderness, these broncos met a bearded mountain man who kindly shared his natural hot tub with them, though the fellow in the headband still seems a bit skeptical about the scenario. That or his bowels are acting up. Yeah, we know it might make more sense to find your musical talent in a lesson room with a teacher, but those of us who prefer a bit more Wild in our lives would leap at the opportunity to take on the breathtaking challenge of strumming the six-string amidst gales an blusters. Here on Timber Top we remember that our souls need a little melody and a little majesty, and Lucy here found both at the same time, in Big Sur, CA. While Zion is renowned for its magnificent geologic features and some of the most diverse wildlife on the planet, it is also an excellent place to explore extraterrestrial worlds. Too often we choose not to notice the vastness of our universe, caught up in menial tasks and trivial disputes day after day. Lay awake one night under the stars, and you may find your spirit elevated and refreshed the next morning. 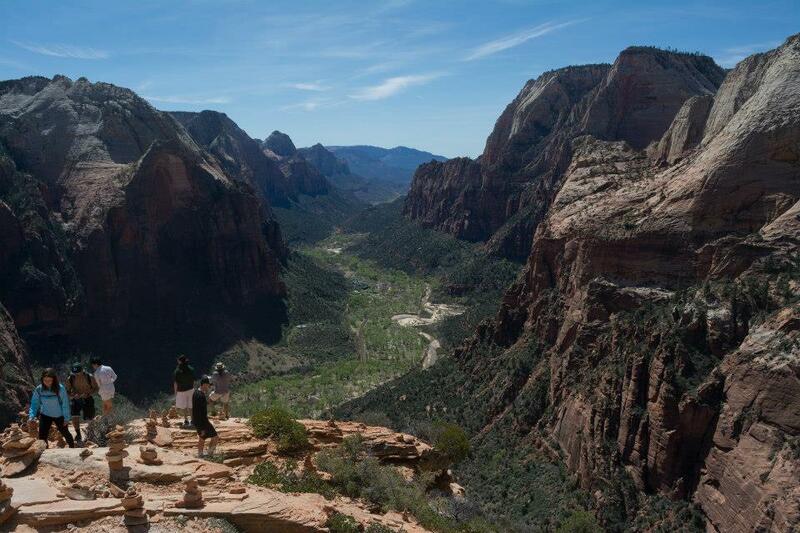 The view at Angel's Landing is nothing short of spectacular. Vast, looming rock walls and a seemingly endless valley that trails off into blue skies, this is truly a remarkable national treasure. Yet as sublime as this canyon is, the group would argue that the magical views aren't what gave this trip it's character. Rather, simply developing a powerful and harmonious outdoor community was the defining element. Take it from sophomore Max Reese: "Yeah, the valley was really cool and all, but for some reason the best part was spontaneously running around in the death valley sand dunes at night." Random as it is, we can never fully anticipate how wilderness will inspire us. I know our top 10 list is getting less and less sanitary, but sometimes showers are overrated. what's better than covering yourself with mud, prancing around as a "mud-model" for a few blissful minutes, and then rinsing it all off in the blue mineral pools at the Grand Canyon's Beaver Falls? The answer you're looking for is: nothing. Nothing is better. This ITW trip must have developed some pretty cool friendships if they allowed themselves to get this weird. No, don't actually do this. It's not wild it's insane. But if you are looking for some wild adventures with a higher survival rate, try backpacking. Once threatened to be submerged in a project that would dam the Colorado River, the Grand Canyon has survived to become a national landmark and one of the most viscerally impactful places in the world. 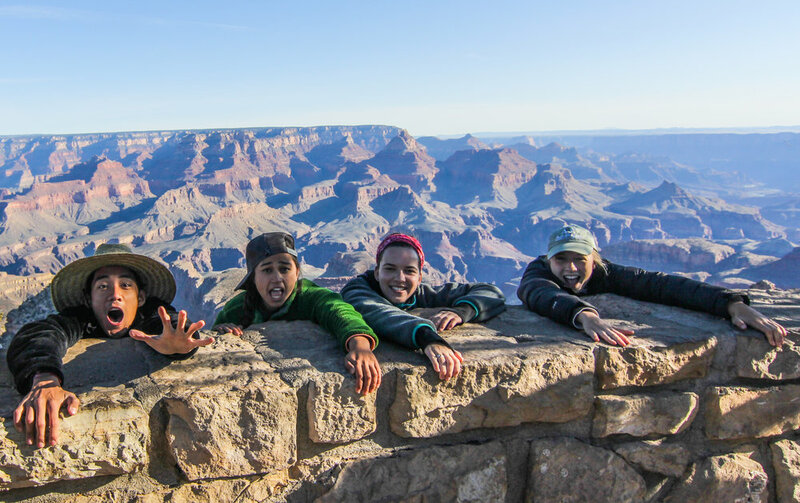 Our final ITW journey found time to hike throughout the canyon, frolic in waterfalls, camp in a canyon glen, and forge new friendships twice as grand as the walls surrounding them. So, there you have it. Next spring break, when you find you have strong thirst for adventure, let us help you quench it. And in the spirit of being Wild, I will leave you with a quote that touches us all.